In Kat’s sparky debut, it’s a trick that works well, with one plotline spilling into the other, so we see Tallie develop as the years slip by, to become the feisty, distrustful girl. She has good reason to be self-protective though, with tragedies bleeding into secrets shadowing betrayals that would make a weaker person cave in on themselves. In the present, as we wait for Edward to wake from a medically-induced coma, we meet his sisters – hen-like Aunt Gillian and glamorous, disdainful Aunt Vivienne, who says of Tallie, “I’m glad you haven’t turned out so nice.” The only sibling not present is their youngest brother Jack, around whom the novel’s biggest secret swirls, signposted tantalisingly throughout. Through the sections from Tallie’s past we get to know the people who matter to her, not least her spiky grandmother Matilda, her beloved mother, moggy Mr Tickles and the mysterious, warm-hearted Malkie. Yet as we accompany on her journey through the years, it’s impossible not to grow emotionally invested in Tallie and feel for her as she wards off angst from a multitude of sources. I’m pretty sure that by the time she’s the hurt adult sitting at her father’s bedside, you’ll be ready to fight in her corner, whatever revelations come. 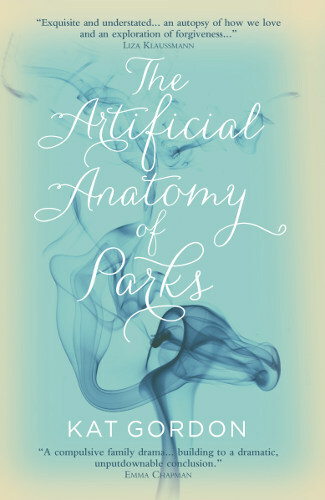 The Artificial Anatomy of Parks by Kat Gordon is out from Legend Press on 1st July 2015, and is available to buy from Amazon. Gain an insight into Kat Gordon’s writing methods. This entry was posted in Reviews and tagged Book reviews, Kat Gordon, The Artificial Anatomy of Parks by Judy. Bookmark the permalink.